E1 – Exemplify professionally-informed, growth centered practice. This means that teachers have demonstrated an understanding of current educational and suggest strategies for improvement. 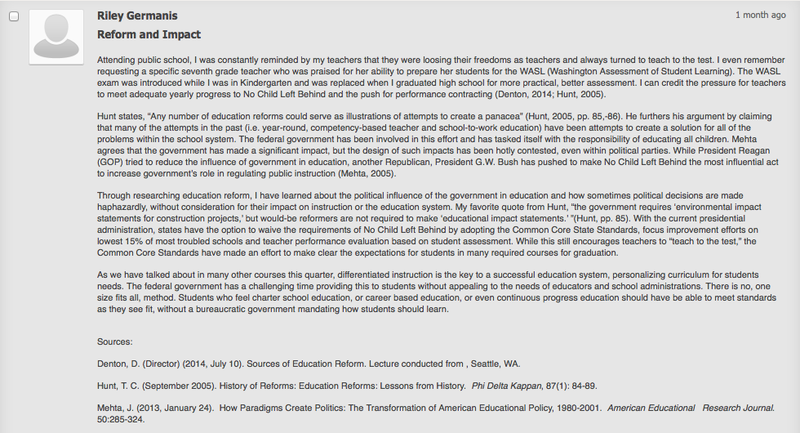 The attached screenshot shows an assigned discussion post about recent reform in public education. Hunt (2005) discusses the problems with previous reform, (i.e. career education reform), as being over ambitious and under studied, claiming that reformists fail to anticipate long term affects when solving short term problems. My discussion post agrees that many reforms do not meet the needs and there is some concern for the Common Core State Standards as they approach full implementation. I suggest differentiated teaching as a potential solution to work around the many reform systems implemented in classrooms. This relates to the program standard E1 because teachers who are educated about policy reform can adjust their classrooms to best fit student needs while accommodating reform policies. Since writing this discussion post, I have learned specific research based strategies for improving classroom instruction such as scaffolding lessons and teaching just above student understanding to maximize learning. From reading articles about education reform, I have learned how implemented systems intended to help the educational process are often challenged and rejected because of cost. An example of this was a class discussion of suggestions from “A Nation at Risk” where longer class days were suggested by researchers, but rejected by politicians because of costs. Students have always been impacted by school reform. In the discussion post, I talk about my experience of the WASL throughout my middle and high school education and how I felt about standardized test reform. Hunt (2005) makes a strong argument in his article about how students change because of reform. One danger of the current standards based education is that low motivation students tend to complete the bare minimum to pass. On the other hand, the standards require generally require more rigorous understanding to meet expectations ultimately raising the level of general education. To improve my teaching and grow as an effective educator, I am pursuing professional development opportunities after earning my teaching credentials geared towards improving math and science teachers and retaining highly qualified educators in high schools. By becoming more engaged with my own professional development, I can collaborate resources with other educators to research and improve teaching to more positively impact student learning during immanent educational reform. Hunt, T. C. (September 2005). History of Reforms: Education Reforms: Lessons from History. Phi Delta Kappan, 87(1): 84-89. This entry was posted in E - Exemplify service to the teaching profession, E1 - Exemplify professionally-informed, growth centered practice and tagged Educational Reform, effective teacher, reflection, Research Based Education, Scaffolding, Standards, Teaching Strategies. Bookmark the permalink.